A workshop has been organised as part of CHI 2010 in Atlanta entitled “Brain, Body and Bytes”. Details are here. The same organisers have also set up a facebook group. This entry was posted in Events and tagged affective computing, BCI, cfp on October 15, 2009 by Steve Fairclough. 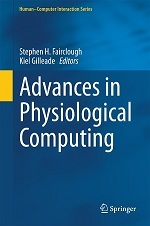 Co-edited by Stephen Fairclough and Kiel Gilleade; an edited collection of the latest research on Physiological Computing. For more information click here. Available from Springer.